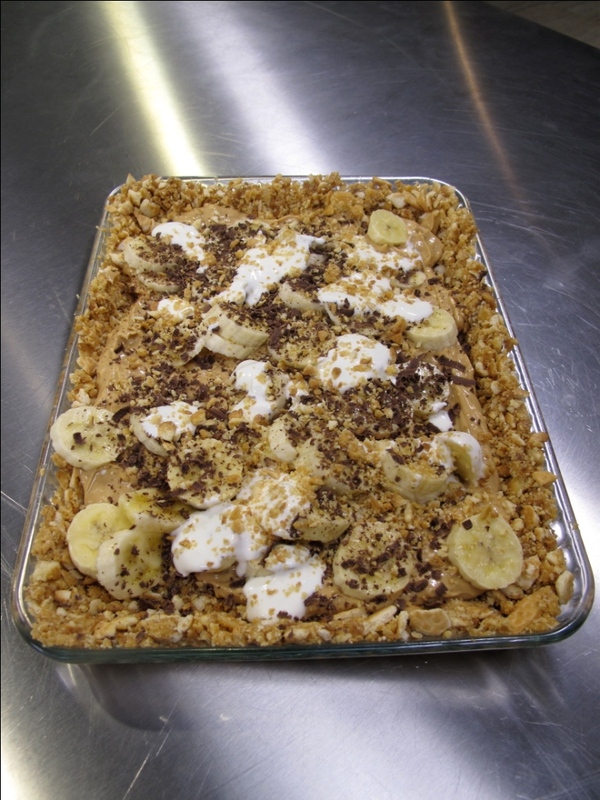 The Banoffee Pie is an English invention and was very popular on restaurant menus in the 1990s. Here is my version. For this recipe you will need a 26cm round loose-bottomed cake tin or a 30 x 20cm glass pie plate. For the base you’ll need: 200g melted butter, 350g Marie biscuits crushed. Method: Melt the butter over low heat in a pan and stir in the crushed biscuits. Press the mixture evenly into the sides and base of the cake tin or pie dish. For the filling you’ll need: 1 can Caramel Treat, 250g smooth Cream Cheese, 2 Tbs Frangelico Liqueur, 4 ripe bananas, 250g Crème Fraiche, dark chocolate for grating over the top. Mix together the Caramel Treat, cream cheese and Frangelico. Spread the mixture over the base and refrigerate for 30 minutes or until firm. 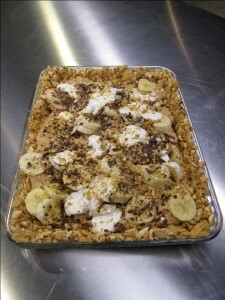 Slice the bananas and make a layer of them over the filling. Place spoonfuls of Crème Fraiche over the bananas. Grate a good layer of dark chocolate over the top.